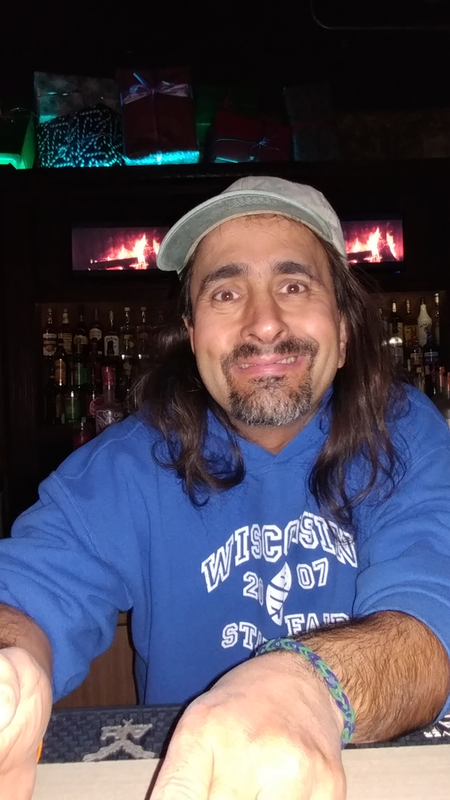 Here is me behind the bar at the local club anything, the last place I worked as a bartender. I gave up bartending as of this past Saturday. I have been bartending off and on for 23 years now. That even sounds like a long time typing it. My grandfather and great uncle were also bartenders. The reason I started bartending was simple, I thought it looked like a cool profession and a great way to meet new people. I was right on both accounts. I took a break in 2002 to focus on my postal career. After returning to bartending a lot of interesting things happened. I met the beautiful lady I now call my own, I met a bar owner I consider a good friend and I met a whole group of new people many of whom I consider as close as family. Bartending has brought me many financial rewards as well. The money was good, I had chances to affect people and learn about their life situations. Yes indeed, bartending has certainly brought a lot into my life. So why leave? Why walk away from a job that I am told I am very good at, more so than any other I do? Why end doing something that brought me such personal and financial success? The reasons are simple and yet complicated. In the case of this particular location, the people stopped showing up. Not really the way one wants to go out, but in business this happens. There was a bout of construction on the street in front of the establishment that I think ended the success we were starting to build there. My lady, who was the DJ that night, and I did everything we could to promote that night. 95% of the time we were the only ones doing so, but still it was tough at best. More importantly, however, my heart is leading me in another direction. So even though my head would say to stick with a job that you are good at and can make a fair amount of coin at, my heart says it is time to move on. Throughout my years on this wonderful planet I have learned when your head and heart disagree it is often wise to pay attention to the latter. I often write about living your passion and that is what I am focused on doing. I am taking Monday to focus on my writing and speaking career. I am determined to make a difference in as many lives as I can in 2017. The money may not be as great, but in doing what I love I feel I can make the greatest difference in the world. I want to take a moment to thank a few people who have made my journey in bartending special. First, Scott Bunker who gave me my first bartending opportunity. Also the 2 Jimmys, Jim Grossmeyer who was my first mentor who taught me the ABC’s of bartending and Jimmy (Pops) O’Leary who taught the spirit in bartending. Selena who talked me out of retirement for the last time. Danny Seiy who not only gave me a home for 3 years, but who also introduced me to the lady I love. Of course a heartfelt thank you to all of you who have ordered a drink from me in the last 23 years. It has been a pleasure to serve you and I look forward to seeing you at a book signing, seminar or some other event down the road.